Well I think most of you read the blog and headed to Taupo over the weekend as most rivers at every car-park seemed to have a dozen cars parked in it with at-least one person I knew or who Â read the website. With high angling pressure fishing was not fantastic for all anglers but those who went the extra distance and fished the hard to get at water found fish in the end. The anglers which were out on the river in the dark getting those flies into the main lies did very well but report that fishing had slowed down in most cases by 9am. ThisÂ is a classic case of the early bird catches the worm and should be put into action especially over the weekend when the bulk of fisherman are about. All rivers have high water in them and we certainly got the flush we were wishing for which has pushed fish into all river systems. Some rivers like the Hine and TT are still quite high but are fishable if you use plenty of weight and quite bright looking glo bugs which cab be snapped up by resting trout. The Hine has had high water for some time now due to the upper dam being let go but with no more rain expected they should shutt this in the next day or so and should create some amazing fishing. The high water has also let some fish get to the spawning grounds un-toutched by anglers which is also very important for the fishery. The Hine has fished very well for most of the season and many fish that in recent years would have made it passed the anglers have been caught above the bridge so hopefully some big groups of trout flew through the system to do their thing so we can once again enjoy consistently good angling from year to year. 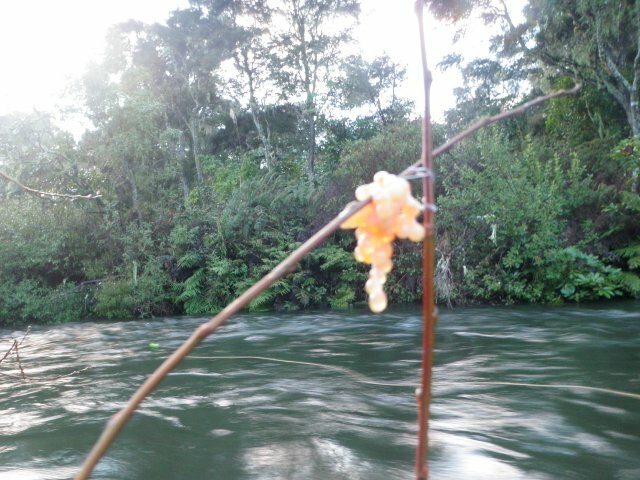 I am usually quiet on the Waitahanui but good advice assures me that some large groups of spawning fish have shot through this river in the last day or so and fishing the middle reaches with orange glo bugs has been very good. I generally don’t fish here but will take a walk in the next few days to try and hook a few for the smoker as they seem to be very good orange fleshed from this water. The locals have been fishing the groin in the straight using almost shift methods so I’m not sure how many fish are getting through here during the day -hopefully there’s no one there at night? I have just spent the last four days with one of my regular clients Phil Norman and his mate Stewart which is a trainee bee keeper over in Queensland-something weird with that!. 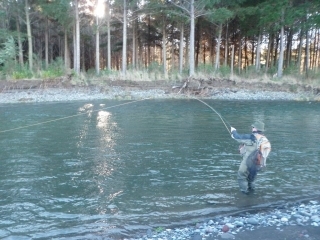 The fishing should have been perfect and easy but as with most anglers we too had to work hard for the fish we caught. Early starts found us with three or four fish under the belt by 8am but we suffered throughout the day averaging a fish an hour which considering the conditions was disappointing. 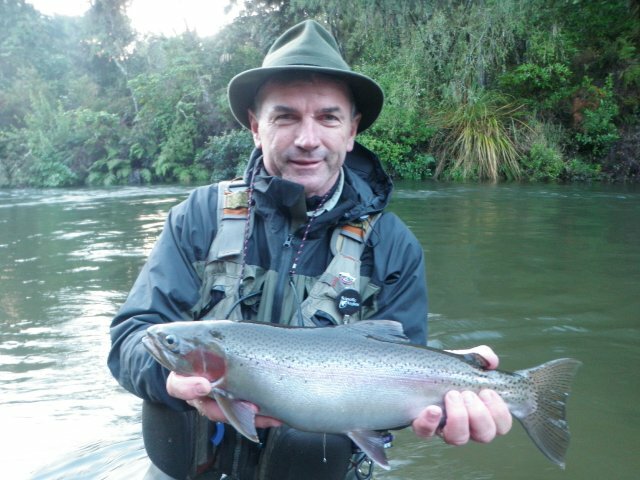 Fish seemed to be very patchy and we would experience plenty of action in short periods throughout the day and we started to get up to reasonable numbers purely by moving around alot and fishing water which was not obvious. Phil and Stewy are very strong guys and we could cross in places which solo or elderly anglers might struggle thus opening up more water which maybe was untouched for a few days. Over the four days we all suffered dunkings,hook piercings and freezing cold fingers but looking back at it another great trip was had by all. Fish numbers were slightly down on Phil’s previous trip but I think we would have pushed it over 50 by day four giving it pretty good day numbers compared to other anglers. 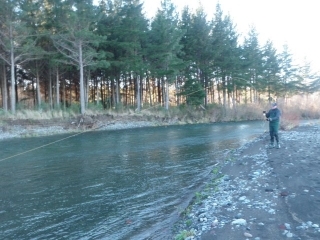 Not one day was similar to another with different rivers and techniques having to be adjusted due to angling pressure and high water levels. 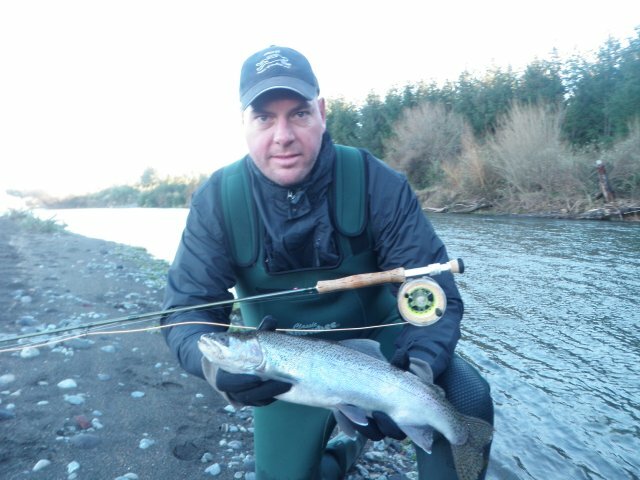 Glo bugs were on the menu on most cases but switching to a small natural when fishing fast riffley runs also proved deadly especially on the mighty Tongariro. 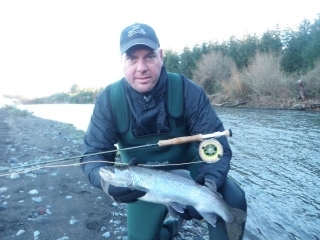 Everyday was great fishing in the morning and this really drummed home the importance of getting out of bed and hitting the river early even if it meant not watching the kiwi’s pump Aussie in the rugby or in Phil’s case Collingwood beat Geelong (the pies were hot). 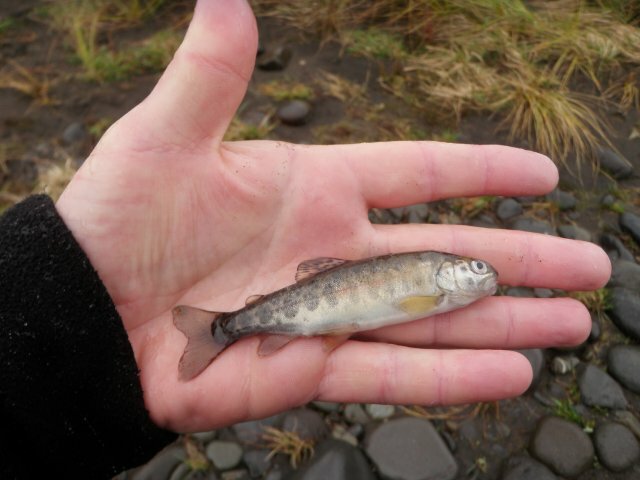 Have taken some interesting pictures while fishing with them and as you can see there are some fairly small par or fry in the rivers at the moment, like the one you can see on the palm of my hand. Fish this size usually don’t count but Phil made sure that thisÂ was one on the board to stay ahead of Stewart in the fish count. 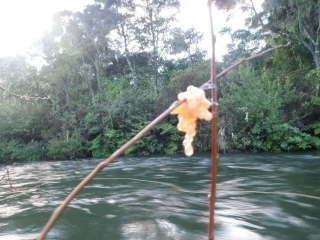 I have seen plenty of glo bugs hanging in trees this week but none quite like the ones we found inÂ pool in the hine this week-again sure signs of poaching at night which needs to be addressed. These were found in the same pool as those spinners which featured in previous reports so I will assume it’s the same culprits again that cant cast. Should be a good week on the rivers guys and fishing should be made easier with river levels dropping so if you have a sick day up your sleeve sneak up and try your luck.